Mannheim (help·info) is a ceety in soothwastren Germany. 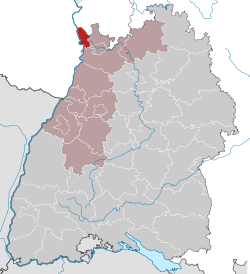 Wi aboot 315,000 indwallers, Mannheim is the seicont-lairgest ceety in the Bundesland o Baden-Württemberg, follaein the caipital ceety o Stuttgart. Mannheim is locatit at the confluence o the River Rhine an the River Neckar in the northwastren corner o Baden-Württemberg. The Rhine separates Mannheim frae the ceety o Ludwigshafen, juist tae the wast o it in Rhineland-Palatinate. The border o Baden-Württemberg wi the Bundesland o Hesse is juist north o Mannheim, an Mannheim is juist dounstream alang the Neckar frae the ceety o Heidelberg. Mannheim is the lairgest ceety o the Rhine-Neckar aurie, a metropolitan aurie wi aboot 2.4 million indwallers. ↑ "Swansea - Wales :Mannheim.de". Mannheim City website. Mannheim City. 2010. Retrieved 1 March 2011. Wikimedia Commons haes media relatit tae Mannheim. This page wis last eeditit on 4 Mairch 2018, at 21:15.